Shrimp bisque (say: Bisk) is a classic, full of flavour, rich and creamy- thick soup. Originally, the shrimp and shells were cooked together and then sieved out but nowadays the stock is made from the shells after the shrimp are peeled. Roasting the shells prior to poaching them heightens the flavour, but isn’t strictly necessary. There is a little flambé to be done here but nothing is complicated. Make this soup and your guests will absolutely rave about it. Hopefully their enthusiasm doesn’t lead to pandemonium. Put in the shrimp shells, leeks, celery, carrots, thyme, bay leaf, orange zest and tomato paste. Cook, stirring occasionally, until the shells are red and the vegetables are tender, about 10 minutes. Shut off the heat and pour in the brandy. Carefully ignite the brandy with the long kitchen match and let it burn until the flame subsides. Turn on the heat, sprinkle in the flour and cook, stirring for about 2 minutes. Add the water to cover the contents and deglaze the pot by scraping up the browned bits with a wooden spoon or spatula. Pour in the cream and bring to boiling but lower heat and gently simmer until the soup is reduced and thickened, about 40 minutes, keep an eye on it. Strain the contents of the pot into a clean pot and season with salt and pepper. Chop the shelled shrimp and put into the pot and simmer for a couple of minutes, just enough to cook the shrimp. Don’t cook more than 3 minutes or the shrimp will toughen and become rubbery. 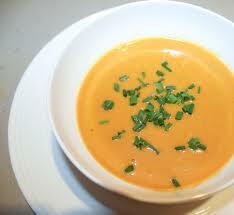 Taste the bisque for seasoning, pour into bowls and garnish with orange zest and chives. If you like shrimp, this marvelous shrimp bisque is made for you. That is a marvelous recipe. Everyone should try it. I used to make lobster bisque when I was much younger.... about the same recipe. Never tried it with shrimp.... but I will. This sounds heavenly. I'm not able to eat shellfish now, but once I am, I'm making this! That sounds divine. I want someone to come over and make that for me right now! After reading your A to Z posts, I seriously need to take a trip to your house for some of these delicious soups. They all sound marvelous! MANZANITA: you're right, it is a marvelous soup, Thanks. JANNA: That will be a great day for you. THE GOLDEN EAGLE: Thank You for saying so. Mmmmm....this looks so creamy and delicious, Anthony! And a little flambe is so fun! I LOVE this, but I've never been game to cook a shrimp bisque before. Maybe I should give it go. You make it sound easy. SUSAN OLOIER: Okay, but I insist that you bring Zane along. I'd be happy to fete you both. LIZZY: You are absolutely right. The flambe is not difficult either. This sounds fabulous, love soup, love shrimp, what more could you ask for. LYNDA R YOUNG: You can do it. Lay out your ingredients and measure them out. Then take it step by step. Give it a go, you'll be glad you did. MIRIAM: Yes it is, Thank You. MARTINE: You're going to really enjoy this bisque. Thanks for calling. Hi Anthony, I'm loving your amazing soups! hi anthony, veyr delicious looking soup, bookmarked with thanks, anxious to try the roasted prawns version. DUNCAN D HORNE: Thank You Duncan, I appreciate your kind words. COOKING VARIETIES: Thanks, you will love this soup. The shells are roasted to extract maximum flavour. BAYGIRL32: That's okay, I assume you don't care for shellfish. Dude, you're killing me here. My stomach is grumbling like mad and my mouth is watering. Om nom nom! RHONDA PARRISH: That is the nicest thing you could've said, Thank You. Anthony, I'd love to bring Zane along. He's a really good traveler, too. SUSAN OLOIER: OK then, don't forget those cool glasses, we going to take him to the gorge and maybe mine for rubies in Nearby N. Carolina.